The two versions compared on this page were released almost six months apart. 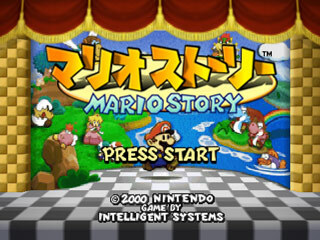 The Japanese version is called Mario Story and has a completely different logo design. The copyright dates are different because the U.S. version was released later, of course. 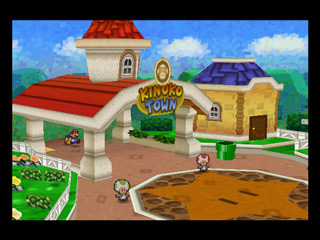 Toad Town, known as "Kinoko Town" (Mushroom Town) in the Japanese version, had its sign changed along with its name. The new sign also has brighter colors and slightly different lettering. 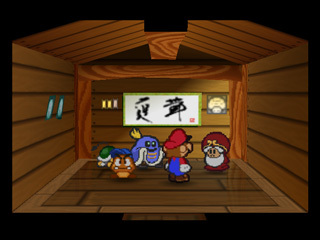 Inside the Toad Town dojo, the Japanese on the wall says "Way of the old man." This is probably referring to The Master's fighting style. It's a play on words; instead of "judo," it says "jido." Correctly answer one of Chuck Quizmo's questions, and a large pink circle will appear in the middle of the screen. In Japan, a circle is used instead of a check mark as a symbol for "yes" or "correct." You'll also see circles used for Sushie's "Water Block" ability, Watt's "Turbo Charge" ability, Lakilester's "Cloud Nine" ability, during the Trivia Quiz-Off with Peach, and during the Bowser Castle guard door's memory challenge. Though Chuck Quizmo's questions stayed pretty much the same, several of the wrong answer choices were changed for the U.S. version. 1) What is the name of Goombario's younger sister? 7) What's the name of the leader of the Red and Blue Goomba Bros.? 11) What is the name of the smart Toad living in Toad Town? 19) What's the name of the elderly Koopa Troopa who always asks for errands to be run? 32) Who among the following lives in Forever Forest? 36) What is the name of the strange person in Toad Town who can increase Mario's status? 38) What does Gourmet Guy like? 56) What is the name of Lakilester's girlfriend? 60) What best describes the relationship between Mario and Luigi? 63) What is the name of the Star Kid who's always with Princess Peach? 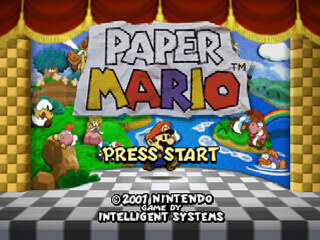 Question #1: "Kurisuchīnu," one of the wrong answer choices, was later used for Goombella's Japanese name in Paper Mario: The Thousand-Year Door. Question #7: Kinton is mashed sweet potatoes. Question #19: The wrong answer choice "Nokotarō" was later used for Koops's Japanese name in Paper Mario: The Thousand-Year Door. Question #32: The names match up except for "Dogabon" (Tubba Blubba). Question #45: Chawanmushi (茶碗蒸し) is an egg custard dish. The answer choice is a play on words, using the kanji "虫" (worm) for "mushi." Question #60: We're sure you can see why one of the answer choices was changed. 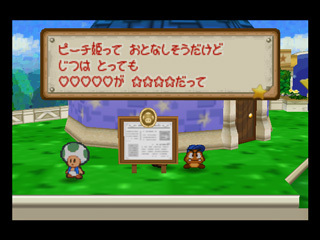 Between Chapters 2 and 3, you can read some juicy gossip on the back of the Toad Town news board. The anonymous Toad posts something different and uses fewer heart symbols in the U.S. version. (Translation: "Princess Peach may seem quiet, but I heard she has a [crush] on [Mario]! 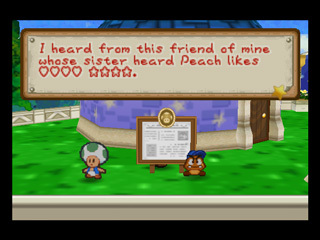 I heard from this friend of mine whose sister heard Peach likes ♡♡♡♡♡ ☆☆☆☆. Anyway, my cousin ✕✕✕ said that ◯◯◯ told her ♡♡ said it's true. You think it is? When Gold Li'l-Oinks leave the farm in the Japanese game, they drop Jelly Shrooms (restores 5 HP and 50 FP), which seems a bit redundant considering the Silver Li'l-Oinks drop Jammin' Jellies (restores 50 FP). In the U.S. version, Gold Li'l-Oinks drop Ultra Shrooms (restores 50 HP). 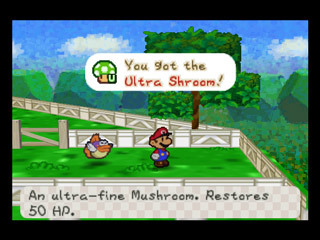 This gives you a way to collect an unlimited amount of the highest HP-restoring item in the game, whereas you can only find five Ultra Shrooms total in the Japanese version. 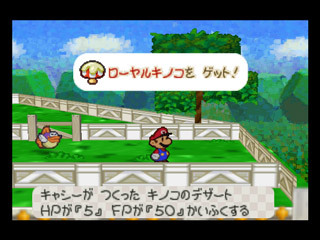 In the U.S. version, Koot says something different for each favor, starting with a catch phrase that usually references an enemy from the game. Below are some examples. Great galloping Goombas! You're a lifesaver, Mario! Oh, thank Star Haven! You've saved me again, Mario! Livid Lava Piranhas! You rule, Mario! During the credits parade, two "Heihos" signs are clearly visible on the wall behind General Guy. 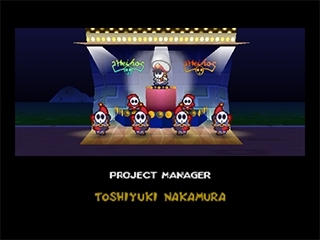 Heiho is the Japanese name for Shy Guys. Boo's Mansion: In Japan, Boos are called "Teresa," which comes from the verb tereru (to be shy). Gusty Gulch: Pyūpyū in its Japanese name represents the sound of the wind. Little Mouser's Shop: Chūchū is the squeaking noise of a mouse. Pleasant Path: Pokapoka means "a warmth throughout your body." ジャンチャージS Jan Chāji S Jump Charge S S. Jump Chg.
ハンマチャージS Hanma Chāji S Hammer Charge S S. Smash Chg.
Mega Jump and Mega Smash: Dokan means "with a bang." Power Jump and Power Smash: Gatsun means "with a heavy impact." Zap Tap: "Biribirīn" comes from biribiri, which refers to an electric shock. コノキノ Konokino Konokino Dane T.
チェリー Cherī Cherry Felissa T.
キタピオ Kitapio Kitapio Frost T.
チビキノピオ Chibi Kinopio Little Kinopio Little T.
リップ Rippu Lip Minh T.
コノピオ Konopio Konopio Mini T.
メアリー Mearī Mary Miss T.
キノッピ Kinoppi Kinoppi Mort T.
グレッブ Gurebbu Gurebbu Mr. E.
エリキノ Erikino Erikino Muss T.
キノポン Kinopon Kinopon Russ T.
キャシー Kyashī Cathy Tayce T.
キノピコ Kinopiko Kinopiko Vanna T.
Gooma: "Kuribā" is a portmanteau of Kuribō (Goomba) and obāsan (grandma). The English name "Gooma" was formed in a similar fashion. Goompa: Similar to Gooma, the Japanese name "Kurijii" is a portmanteau of Kuribō (Goomba) and ojiisan (grandpa). Kammy Koopa: "Kamekkubaba" is a combination of Kamek (Magikoopa) and baba (old woman). Li'l-Oinks: The sign by the Li'l-Oink farm calls them "Li'l Oinks" without the dash, but Goombario and the Toad who stands next to the farm call them "Li'l-Oinks." Their Japanese name, "Būbū-san," comes from būbū (oink-oink). Madam Merlar: Her Japanese name comes from kurisutaru (crystal). Nomadimouse: Chūchū is the squeaking noise of a mouse. Oaklie: His Japanese name, "Mōrī," is a play on mori (forest), which sounds like the given name Maury. Petunia: Hanako literally means "flower box." Rip Cheato: Bottakuru means "to rip someone off." Rowf: Roten means "street stand." Tayce T.: Her name is "Cathy" in the Japanese version, hence the several "Cathy" recipes. Toad names: Several Toad characters' Japanese names are based on kinoko (mushroom). バケクリオ Bake Kurio Bake Kurio Goombario??? バケカメキ Bake Kameki Bake Kameki Kooper??? バケピンキー Bake Pinkī Bake Pinky Bombette??? バケパレッタ Bake Paretta Bake Paretta Parakarry??? バケレサレサ Bake Resaresa Bake Resaresa Bow??? バケアカリン Bake Akarin Bake Akarin Watt??? バケおプク Bake Opuku Bake Opuku Sushie??? バケポコピー Bake Pokopī Bake Pokopī Lakilester??? ノコブロス Noko Burosu Noko Bros. Koopa Bros.
Bandit: His Japanese name "Borodō" is a play on dorobō (thief). Bloopers: Gessō comes from geso (squid tentacles). Buzzy Beetle and Spike Top: The metto in their Japanese names is an abbreviation for "helmet." Bzzap! : "Hatchī" comes from hachi, the Japanese word for bee. Chomps: "Wanwan" is equivalent to the English "Bow-wow." Duplighost and Lee: "Bake" comes from bakeru (to appear in disguise). Paragoomba and Paratroopa: Patapata is onomatopoeia for wings flapping. Ruff Puff and Tuff Puff: Their Japanese names are derived from kumo (cloud). なにがおこるかな Nani ga Okorukana What Will Happen? Mystery? Lakilester's Spiny Flip: "Paipo" is the Japanese name for Spiny Eggs.